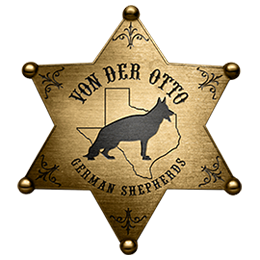 Von der Otto specializes in raising the Highest Quality Standards of World Sieger German Bloodlines. Our German Shepherd Puppies and German Shepherd Dogs Offer Excellent Protection of Children, Families and Single Women. We are located in Rockwall close to Dallas, Austin And Fort Worth Areas Of Texas. We are a family owned business with the personal touch not offered at most kennels. We started several years ago buying our first female to start our business. Before entering into the business we spent years researching the different bloodlines of German Shepherds. 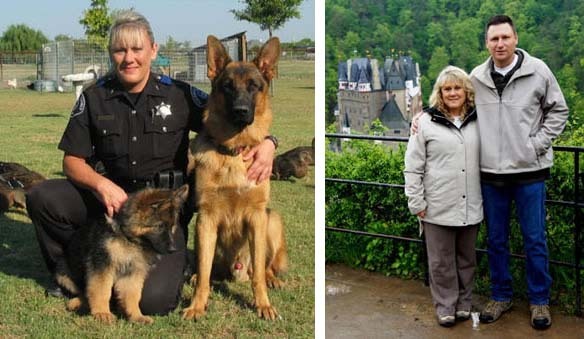 Working with different police departments assisted us in our search for the quality of German Shepherds we wanted to breed. Throughout the years of owning and working with German Shepherds we have been around both the German bloodlines and the American bloodlines. In our experience the American lines do not have the same qualifications offered by the German lines. To read about the difference of both breeds go to German lines vs American lines. For more information about German titles and testing in our pedigrees go to German Terminology and German Breed Standards. I met my husband, Dan at the Sheriff’s Office. We have both worked at the Sheriff’s Office for over 10 years. Dan is a Patrol Sergeant and I am a Deputy Sheriff. Working in law enforcement allows us to work with several police agencies during K-9 operations. Because of our line of work we have seen first hand the difference between the working lines and the show lines. It is very important for someone to understand the difference, because there is a vast difference. The working lines are exceptional at what they are bred to do. They have extremely high energy which makes them better for law enforcement when searching hours for a suspect or sniffing large areas for drugs. A working dog has to have something to do at all times or they will get bored. That kind of energy does not work well for a family and in a home atmosphere. What I searched for is a line of German Shepherds that would be naturally protective, not afraid of any situation, proven to be the best generation after generation and still have the calmness to be good with children. We found that dog in the West German Show Lines. To receive a top show rating of either a V or VA the German Shepherd is required to be excellent in all fields. The hips have to be certified with either an “a” stamp or OFA, excellent conformation, obedience title (BH), pass an endurance test (AD), a courage test, bite work, and tracking (SchH 1, 2 or 3). They cannot be distracted or show any aggression towards the judge, stud dogs or female dogs around them, but be ready to bite when asked too. For any dog to accomplish all these things is remarkable. To read and understand more about what is required for each phase of testing go to German titles and ratings. Our females when they are pregnant are kept in the house. They relax all day on the couch, happy and healthy. When they are ready to birth the puppies we take the whelping box into our den where we whelp the puppies. If it is winter we have a nice cozy fire. Either my husband or I are with them throughout the entire delivery. We assist the mother as needed. We make sure the puppies are getting plenty of milk. Then we will move them to the puppy room in our house. I get up throughout the night to check on the mother and the puppies to make sure everyone is doing okay. The mother and the puppies will stay in the house until they are weaned at six weeks old. Then I either move the mother or the puppies to the kennel. Our puppies are allowed to run around our house when they are old enough to walk. We are always giving the puppies a lot of attention. I believe in imprinting the puppies from the time they are born. We also allow our customers to come visit during the first 8 weeks to build a bond with the puppies and to help with socialization of the puppies. If we have more than one litter in the house we have our office set up to be able to put another whelping box in it. We will whelp every litter the same. We try to only have two litters at a time. If we have three, which is very seldom, I can fix a place in my bathroom. Usually the third litter is in my bathroom for only a week. Then I move them to one of the other two rooms. I teach all my dogs in the house to respect the mother's privacy. Our kennel is located in Rockwall, Texas 30 miles east of Dallas, Texas on seven acres. Our home is usually full of either children or dogs most the time both. In 2008 we bought property in Oklahoma surrounded by the National Forest 35 miles from Arkansas. Our Dogs and Puppies have plenty room to run and explore. They also go with us in the spring time trail riding behind our Oklahoma property, since there are miles of forest managed trails right out our back door. Between our property in Texas and Oklahoma the dogs have plenty of room to run, play and get plenty of excecise. The dogs love both places, but Oklahoma is our vacation spot for both us and the dogs. Our dogs are a big part of our lives, as you can see. Our dogs are not just breeding dogs to us they are part of our family.